Antique brass raised plate 10 amp light switches complete with matching brass rocker switches. Intermediate switch also available were a third switch is used to operate the same light eg.landing light. Antique brass 13 amp raised plate plug sockets with matching brass rocker switches. 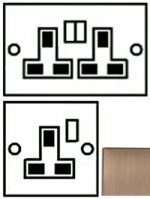 Single or double plug sockets available. 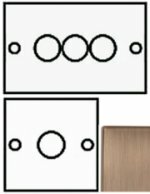 Antique brass raised plate 2 way, push on/off, dimmer switches, available in 250 or 400 watts. Antique brass Victorian 13A fused switch. Available unswitched, or with a switch. Please select type when ordering. Antique brass master and extension telephone sockets.